HUDSON RIVER– On January 15th, 2019 the last piece of the “old” Tappan Zee Bridge was destroyed. 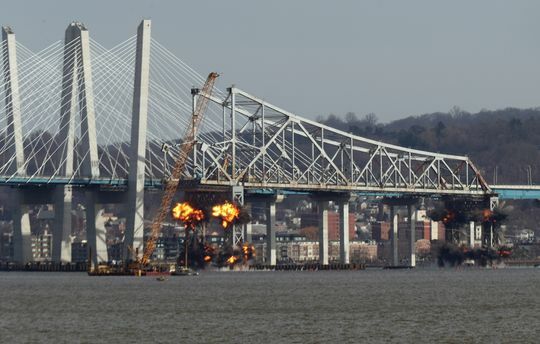 The demolition of the Tappan Zee Bridge was scheduled for 10:00 A.M., but the demolition was delayed. Eventually it actually started at 11:00 A.M. More than 40,000 people were watching the demolition on TV. “I think it was cool how the poles holding up the bridge were blown up at the same time, and how the bridge fell down,” NN described. “I thought it was cool to see it implode and see the legs of the bridge blow up,” MB expressed. In order to destroy the last piece of the Tappan Zee Bridge, the workers had to blow it up safely so that the new bridge wouldn’t be damaged. The workers, the owners, the architects, and many other people worked together and blew up only the supports, so that everyone and everything would stay safe. When the supports were blown up, the structure just fell straight down without breaking before going straight and flat into the Hudson River. The workers later picked up the piece of the bridge from the river. “I think it was cool to see the bridge explode,” SP shared.